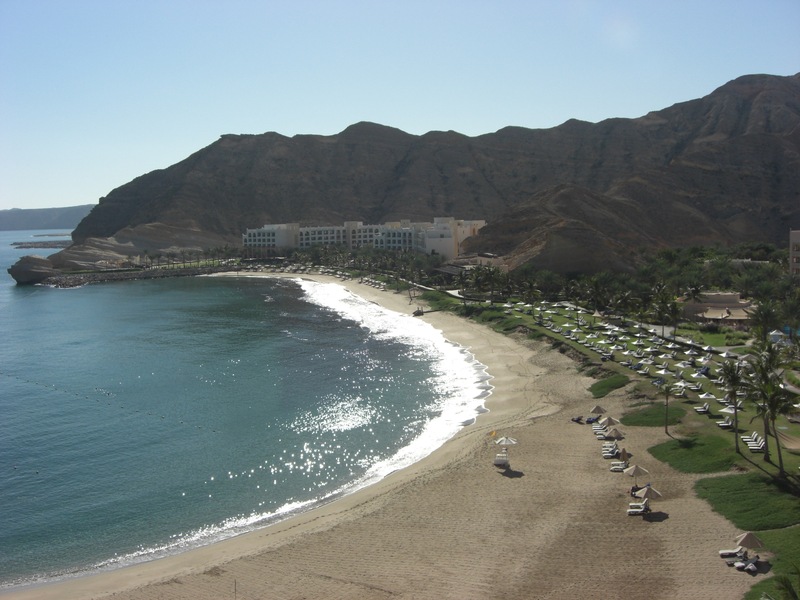 Oh, what to pack for a beach vacation in the Sultanate of Oman? Are bikinis allowed? Swimming suits in general? Will I have to invest in a burkini like the one Nigella Lawson wore earlier this year? Turns out our resort is very Western-friendly. In the evening there are plenty of Muslim couples walking around, both wearing long robes (his white, hers black), but there are also plenty of folks who look just like us. Bikinis are allowed here, though I haven’t seen many people except foreigners hanging out at the beach. Most of us make sure to use a wrap or cover-up of some kind when walking between hotel & beach. The resort’s 21 (21!) restaurants require both men & women to dress “resort casual” and I’m grateful I brought a collection of pashmina-type wraps for evening. I feel just a tad less conspicuous that way. But honestly, none of the locals have given us so much as a sideways glance, even at the airport. Everyone has been extremely polite, cordial, and basically uninterested in what we look like. Everything that I’ve read and seen so far about Oman indicates that it is one cool Arab state. Last year it won first place out of 135 as the “nation most-improved” from the UNDP. Its healthcare system is ranked #8 by the World Health Organization. The country is privatizing and diversifying its economy, with a special emphasis on tourism. The geography looks like Arizona, but with an ocean. Oman is home to the world’s only camel-backed bagpipe military band. What’s not to like about this place?? Our hotel, the beautiful, has-everything-you-could-ask-for Barr Al Jissah. Looks like a wonderful place. enjoy and Merry Christmas!!! Thank you Carolyn, and Merry Christmas to you guys. I’m happy to see you online! Merry Christmas, jen and Seb! Looks like a great get-away. Have had trouble replying in this format but love your posts! Oh my does that beach look inviting! Thanks for sharing your latest adventure and good luck deciding “appropriate” wear at resort restaurants! … be sure to add plenty of sunscreen protection … burnt lips and a burnt forehead are for the birds! I would love to hear the camel-backed bagpipe military band play or tune or two! Yes, wouldn’t the bagpipes be interesting! Incidentally, we enjoyed live music most nights during dinner — outside with hookah pipes in hand — it was just fabulous. I don’t remember any bagpipes, but the sitars (or something similar) were cool! Love it. Wish we were there. Merry Christmas!! I’d highly recommend it, my fellow world-traveler. Oman gives you a taste of the exotic without the drama (though I haven’t checked the State Dept info lately…) Plus the landscape is like Arizona but with an ocean! Yes, there is a section of the resort for families, and another section (where we were, naturally) that is kid-free! Afternoon tea, happy hour (with alcohol, except during Ramadan, I heard) outside next the fountains, it was fantastic….